American scientists have shown that the angle of inclination of the rotation axis of Ceres is changing very rapidly. This is due to the influence of Jupiter and Saturn and leads to the appearance on the surface of a dwarf planet of mysterious bright spots. The corresponding study is published in the journal Geophysical Research Letters, briefly reported to NASA. Over the past three million years, the angle of inclination of the axis of rotation ranged from 2 to 20 degrees. Approximately 14 thousand years ago, this angle was equal to 19 degrees, now it is about 4 degrees. Such changes are due to the gravitational influence on the dwarf planet of Jupiter and Saturn. Scientists managed to find a connection between the water ice reserves on the surface of a dwarf planet and the oscillations of the angle of inclination of the rotation axis. The presence of water in certain areas requires that they remain in the shade for millions of years. The smaller the angle of inclination of the axis of rotation of Ceres, the more its surface is in shadow and vice versa. Scientists managed to determine those parts of the dwarf planet, which, even at high angles of inclination of the axis of rotation, are in shadow. It turned out that where the Dawn station had previously noticed the so-called mysterious spots, there are craters. Using the apparatus, the nature of one of them was determined. A bright spot formed by ice, preserved on the surface of a dwarf planet. 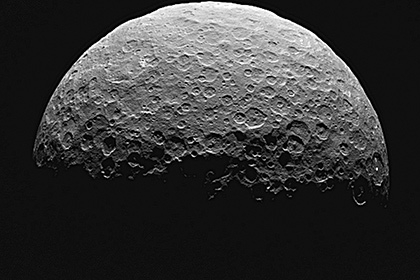 Now scientists believe that most of the dark areas of Ceres contain water ice. The slope of the axis of rotation is the deviation of the axis of rotation of the celestial body from the perpendicular to the plane of its orbit. For the Earth, this parameter is approximately 23 degrees. The presence of seasons on the planet is associated with it. The Dawn station was launched on September 27, 2007 using a Delta 2 launch vehicle from the cosmodrome at Cape Canaveral in the United States, and on orbit around Ceres was March 6, 2015. The cost of the project to study the asteroid Vesta and the dwarf planet Ceres is more than $ 500 million. Ceres was discovered in 1801 by the Italian Giuseppe Piazzi and named after the ancient Roman goddess of fertility. The diameter of the space object is about 940 kilometers, which makes it the largest celestial body in the asteroid belt between the orbits of Mars and Jupiter.